Where can I store my luggage in Barcelona? There are many reasons you might find yourself in the centre of the city with no luggage storage lockers in sight and nowhere to leave your luggage. Say your Airbnb host needs some time to prepare your accommodation or you checked out with plenty of time before your flight. Why lose precious moments of your trip carrying your heavy luggage around the city? If you asked yourself “Where can I leave my luggage near me?” you’re in the right place, we have got you covered with our comprehensive luggage storage guide to Barcelona. Stasher offers you convenient, affordable and fully insured luggage storage thanks to a network of hundreds of local shops and hotel. Our goal? Take that burden off your hands and help you enjoy everything Barcelona has to offer, luggage-free. Offering you safety and peace of mind is essential to us at Stasher. That’s why we’ve made the process of dropping your luggage with us convenient and affordable. ✔️We have partnerships with reputable hotel chains such as Premier Inn and Accor Hotels. How much does it cost to store your luggage in Barcelona? Where are the StashPoints for my luggage in Barcelona? When it comes to luggage storage in Barcelona, our designated StashPoints are close to all the major attractions and transportation hubs so you can find one easily. There are many available options for storage around Barcelona attractions, like the Sagrada Familia, the Barcelona Port, Placa de Catalunya and Camp Nou, home grounds of the legendary Barcelona FC. We understand your need for flexibility, so most of our StashPoints are open 24/7 or until late. However, we recommend checking your designated StashPoint for their opening hours before making a booking. Head to your StashPoint with your booking confirmation email as well as your id. Drop off your luggage and enjoy Barcelona. Now that you’re luggage free, it’s time to take in everything the city as to offer. Barcelona is one of the most visited destinations in Europe and home to one of the most famous football clubs in the world. 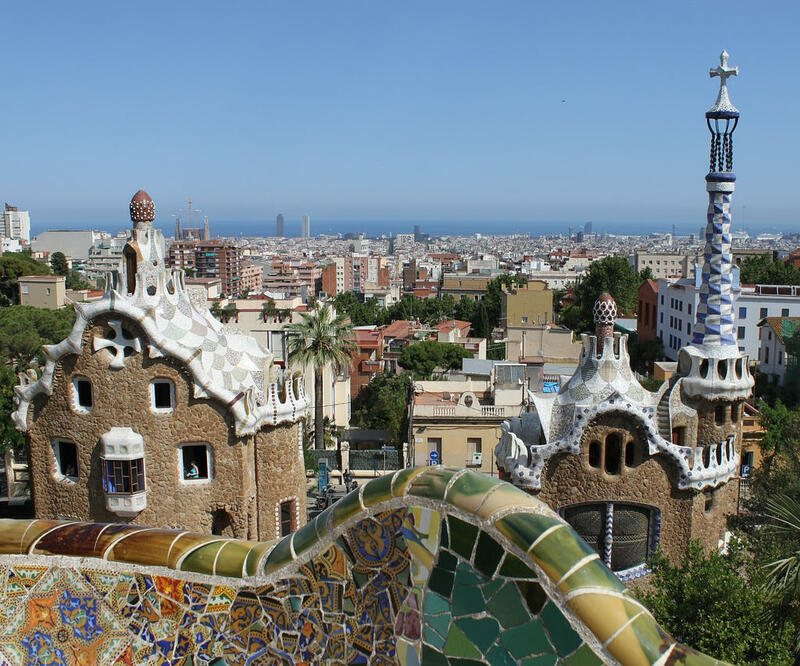 Whether you’re here to catch a football match or to admire the groundbreaking architectural works of Antoni Gaudi, Barcelona is bound to take your breath away thanks to its rich history and vibrant nightlife. Where can I find luggage storage near Sants Train Station? Meeting Points Hostel, located around the corner from the train station and open 24/7. Bookings must be made online here. Umair Moviles Y Informatica, open until 9pm, 6 days a week, closed on Sundays. The main facility is open 24/7, so you won’t have to change your plans to accomodate for pick-up times. It’s €5 per day per item. Barcelona Sants Train Station is the primary train station for national and international arrivals and departures. Trains from Paris and Marseille all arrive here. The station is a 10-minute metro ride from the centre of town. Head here for a detailed map of Barcelona transport system. The transfer time by train from Barcelona Sants to Barcelona Airport Terminal 2B is 20 minutes on the RENFE train. If you’re leaving from Terminal 1 you can take the free shuttle bus. For detailed information about the train station and its surrounding area, head here. Where can I find luggage storage near Barcelona Nord Bus Station? ANT Hostel Barcelona, less than a 5-minute walk from the bus station and open 24/7. Hotel Oriente Atinam, open 24/7. Open 24/7, 7 days a week. We recommend checking opening times before making a booking. Most national services depart from Estació del Nord. Many international services also pass through here. The quickest way to get to the bus station is the Cercania train service, as it only make one stop. Alternatively, the closest metro station is Arc de Triomf / Marina (Red Line, L1). A secure area with guards around the clock, the Sants Train Station left luggage has approximately 100 lockers. Find it towards the rear of the train station next to McDonalds. Small lockers will hold hand luggage size; a large locker will hold a regular suitcase; there’s no provision for oversized items. All luggage will be scanned through an X-ray machine. €9.00 fee for losing the key. Located outside the bus terminal, there are 50 lockers of various sizes available. There are only 4 ski lockers, so you may not be able to get the size you need during busy times. The area is not manned or secure.